Mukesh Ambani is Indian businessman and chairman of Reliance Industries Limited. Ranked as the wealthiest person in India, he is also seen as one of the world’s most influential people and his company is one of the most valuable companies in India. As of 2019, Mukesh Ambani’s net worth is roughly $49 billion. Mukesh was born in Aden, Yemen on April 19, 1957, to Dhirubhai Ambani and Kokilaben Ambani and he has two sisters and one brother. His father worked for a firm in Yemen but relocated to Mumbai in 1958 to start his own company. His father began with spices but soon moved towards the textile business and eventually became one of India’s most well-known business magnates. Mukesh and his brother graduated from the Hill Grange High School in Mumbai, India and he later went to the Institute of Chemical Technology to get a degree in Chemical Engineering. He attended Stanford University in the US for a short while, but he soon dropped out to help his father establish Reliance Industries. When he officially joined the Reliance company with his father, one of the first things he did was help him establish a polyester filament yarn manufacturing plant. He soon became the creator of the company’s backward integration from textiles to fibers to petrochemicals. He led the establishment of 51 brand new, top of the line manufacturing facilities and aided in the technological advancement in the company. After his father’s death, Mukesh and his brother divided the business, and each got separate sections of it. Mukesh currently holds several positions within his company including Chairman, Managing Director, Member of Employee Stock Compensation Committee and Chairman of Finance Committee. His company, ‘Reliance Industries Limited’ has been ranked as one of the Fortune Global 500 companies and is among India’s topmost valuable companies. Growth truly is a way of life. We all make mistakes and have some victories but what we learn from these experiences is what teaches us to move forward and grow as human beings. Every individual has equal opportunities in every aspect of life. No matter who you are or where you come from, you should have the right to do just as much as any other human being. Success is never easy and just because you fail the first time does not mean that you should give up on yourself. Learn from your failures and allow them to aid you and help you grow for your next endeavor. We each have the ability to accomplish whatever we want. Mukesh Ambani is one of the wealthiest men in the world, and his company ‘Reliance Industries Limited’ is among the top wealthiest companies in India. He has established himself well in the business world and has done plenty of work in the business world. As of 2019, Mukesh Ambani’s net worth is approximately $49 billion. 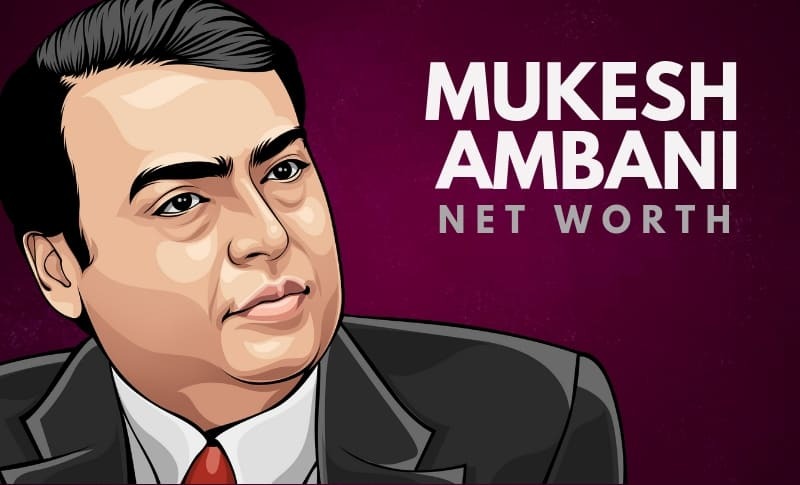 What do you think about Mukesh Ambani’s net worth? Leave a comment below.